Welcome to a brand new blog post! Trinity Leeds invited me to Trinity Kitchen to try some of their new vendors so I thought that today I would tell you all what I thought about them. If you havent heard of Trinity Kitchen then let me tell you all about it. Trinity Kitchen is an open plan food court within Trinity Leeds that serves a plethora of food from different cultures such as Vietnamese food from Pho, Italian Pizza's from Pizza Luxe, Mexican food in the form of Tortilla and much more. Every so often, Trinity Kitchen like to bring in six different street food vendors to give variety but to also ensure that new businesses are getting exposure. Myself and Luke (who comes to most of the events alongside myself) made our way around to Trinity Kitchen and decided to sit down in a sort of quiet sectioned off corner that had a wide rectangular glass window overlooking the wonderful architecture that surrounds Trinity Leeds within the city centre of Leeds. We decided to start off by checking out Tikks Thai Kitchen. 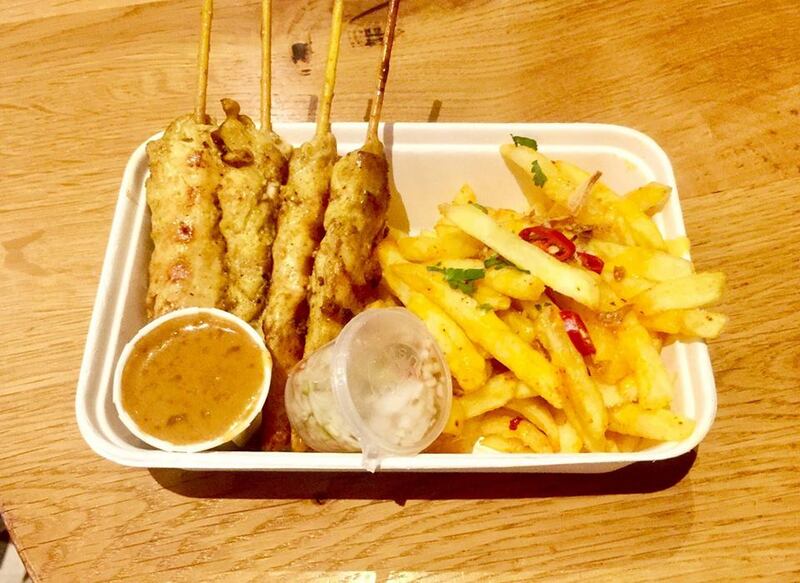 Tikk's Thai Kitchen is known for cooking amazing yet authentic Southern Thai Street Food. The reason behind why the business is called Tikk's Thai Kitchen is well because all the food is prepared and cooked by Tikk who is an Thai Native and a trained chef. We enjoyed a dish of Chicken Satay and Sriracha Fries which came with a wonderful nutty Satay Dip and some wonderful fried Shallots. I love Chicken Satay! This Chicken was wonderfully charred but still tender which I think is quite hard to do as sometimes charred Chicken loses all of its moisture. The Dip was wonderful light and nutty. Luke hates Peanuts but he loved this dip which well contained Peanuts! The fries were crispy and the Sriracha gave a slight tang to them which I loved. The Shallots were there to add a bit of crispness but also a tad bit of cooling if you thought the Sriracha was a bit too much. I'm still wondering why I haven't tried Sriracha Fries before this because I was missing out! 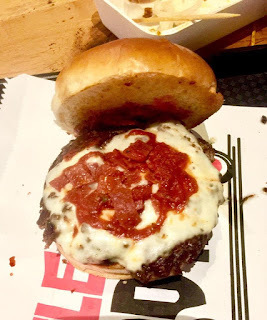 The next place that we decided to try was Sela Bar who have collaborated with Little Red Eats to create a vendor that creates amazing burgers ranging from ones from ones with Candied Bacon and one that was made for Cheese Lovers. I decided to get a Pizza Burger to share with Luke. Yes, you heard right! A Pizza Burger. This Burger consisted of an great homemade Beef Burger topped with a great Tomato Sauce, Mozzarella, Pepperoni and a whole host of amazing goodies. I did think that this would be more of a just an Instagrammable product and that it woudn't taste amazing but oh my god did I eat my words and much more. The Patty was succulent and delicious. The powerful tomato sauce against the creamy Cheese was wonderful and the little pieces of Pepperoni gave the burger an extra lift of flavour and texture. I was kind of glad that this came in a Brioche Bun. I love the good old Sesame Seed Bun but I also love a smooth Brioche Bun as you don't get Sesame Seeds everywhere. I would definitely recommend this to anyone that's going to Trinity Kitchen soon! The last vendor that we decided to visit was Meli Patisserie Meli Patisserie create amazing cakes, sweet treats and mousses to fill that sweet hole that has been left in your soul. We tried a Lemon Cake which consisted of a White Chocolate Sponge, White Chocolate Mousse and Lemon Curd smothered on the top and a Baileys Cake which consisted of Dark Chocolate Sponge, a wonderful Baileys Mousse and smothered in Dark Chocolate Ganache. I loved the Lemon Cake as it was sweet but tart at the same time. Luke loves White Chocolate and Lemon so he was in heaven with this one! 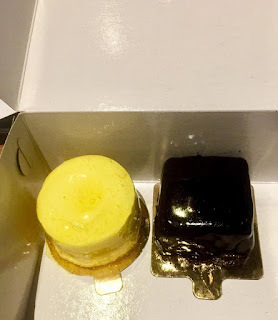 The Baileys cake has a sort of deep sweetness going on due to the Dark Chocolate but I loved it. I'm not the biggest fan of Dark Chocolate sometimes but when paired with the Baileys Mousse, it was divine! These would be divine when catching up with friends! Trinity Leeds has some other amazing vendors at the moment including Food4Festivals who create great Greek food including Gyros, Gravy Train Poutine who create amazing Canadian Poutine and Bunnymans Bunnychow who create amazing South African food that comes in an edible bowl. Check out Trinity Kitchen here. Have you tried any of the above vendors? Would you try any? Let me know down below! Thanks to all of the vendors for creating amazing food and the wonderful gius at Trinity Leeds for inviting me along to try the vendors. Thanks for reading this food based blog post. I hope that you enjoyed it. I hope that you come back next time for another blog post!